This card actually fits for 2 Power Poppy challenges...the Hues to Use and the Mix and Match. Sadly, I needed to make a sympathy card as a gal I used to work with lost her son in a motorcycle accident in Anchorage last week. I'm friends with one of her best friends and this card is going to the best friends, while I work on another card for the mom. This digital stamp set was on sale in the Power Poppy shop and I didn't have it yet so of course I scooped it up. 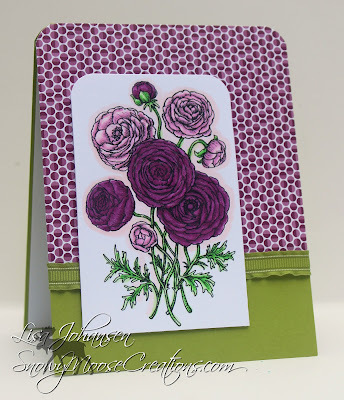 For the purple and light pink in the color challenge I incorporated that by coloring the flowers with those hues. I also used a light pink to do some shadowing around the flowers. It's hard to see on the purple flowers but I added Wink of Stella to them. The sentiment is from the Olive and Oak digital set (which is the set I'm using to make the sympathy card for my former coworker), so that qualifies this card for the mix and match challenge, as the flowers are from the Ranunculus Digital Stamp set. Such a gorgeous way to use the colors! !